Diehard fans of Danny Serfer’s Blue Collar know to arrive early to avoid a long wait for a table. 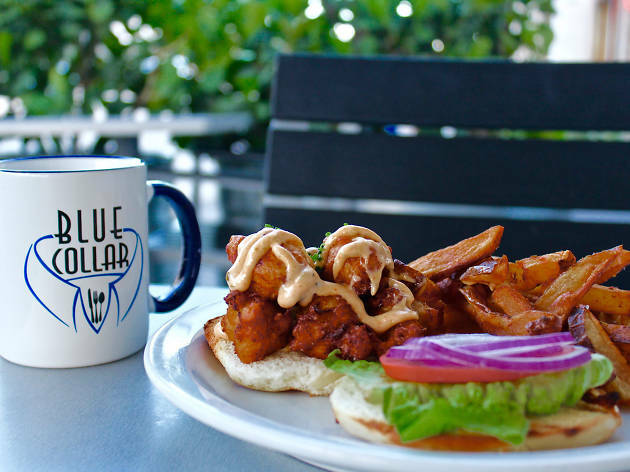 The tiny three-year-old restaurant in an old-school motel in Miami’s Upper East Side/historic MiMo District is consistently packed, and it wasn’t until recently that it started accepting reservations for lunch, dinner and brunch service. 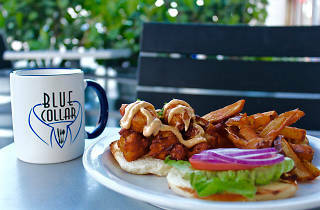 Blue Collar’s allure stems from the chef/owner’s unpretentious approach to American classics and comfort food in dishes like conch fritters with spicy tartar sauce, fried green tomatoes with buttermilk dressing and a braised brisket sandwich on Portuguese muffins with Dijon mustard, jus and latkes and apple sauce. The veggie-only chalkboard boasts a selection of more than 20 plates for side dishes or a vegetarian smorgasbord; pair the curried cauliflower puree and the sauteed kale with crushed red pepper, shallots and white butter. A rave-worthy chocolate cake made by the lead cook’s mother (it’s literally homemade!) is the restaurant’s secret weapon. Margaret uses Valrhona chocolate from France, and one slice is oftentimes not enough.